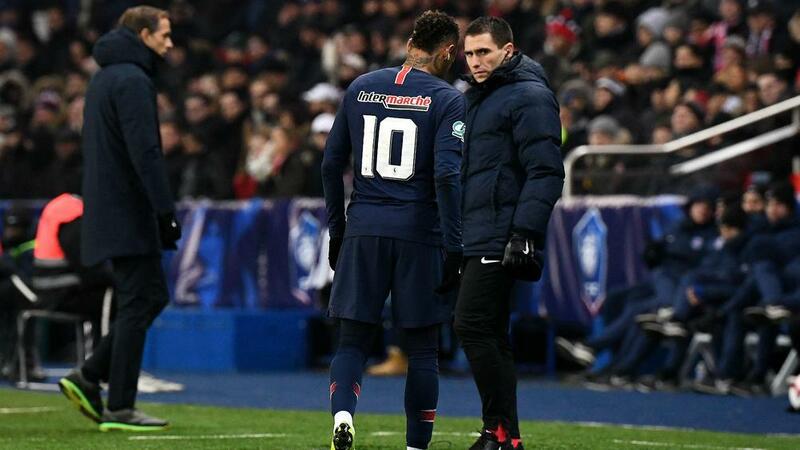 Paris Saint-Germain coach Thomas Tuchel admitted he was "worried" after Neymar was sent to hospital with another foot injury sustained in the Coupe de France round-of-32 win over Strasbourg. Neymar withdrew himself in the second half of PSG's 2-0 victory having appeared to twist his right foot following a robust challenge from midfielder Moataz Zemzemi. Tuchel later confirmed the Brazilian was sent to hospital and PSG were anxiously waiting for the injury verdict. Last February Neymar suffered a fractured metatarsal and a sprained ankle that ended his domestic season. "No, I did not talk to Neymar [after the game] because he's in the hospital," Tuchel told Eurosport. "Yes, I'm worried. It's always complicated [with these kind of injuries]. "It's the same foot and the same metatarsal [as the previous injury]." PSG face Manchester United in the first leg of their Champions League last-16 tie in less than three weeks' time.